This training diary is designed for all kinds of sports. 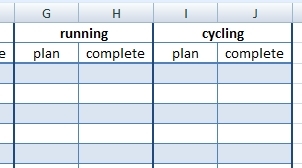 You can write the plan to the table and control its implementation and monitor your progress. The template is especially suitable for recording numbers of pushups, chin-ups, running, cycling miles (kilometers), pools, every fitness performances and many others sports activities. 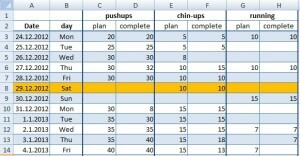 This Excel file offers weeks and months statistics of your training. If the plan is not complete, the cell turns red (applies to weeks and months statistics). Actual day, week or month is highlighted by orange color. To change the starting date just change the date in the cell A3 on the Days sheet. 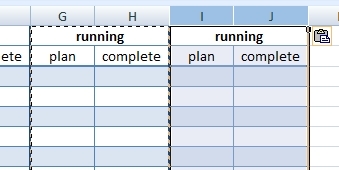 1) Select the last two columns of the table on the Days sheet and press copy (ctrl+c). 2) Paste them (ctrl+v) next to the table. 3) Rename sport activity. 4) Do the same on the weeks and months sheet. If you find errors, please leave a comment, thanks. 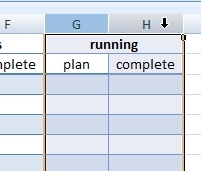 Can I download excel template version for 2017? how can I use this workout app for the year 2017? I think it is much better than android apps. Yes, you can create Trainig diary 2017 from it. Just edit cell A1 in sheet called days.